Leaving behind a promising career in his home country of Chile to move abroad for the first time, Juan Pablo Brotfeld took the leap to study an MBA at Bath last year—and he hasn’t looked back since. Having worked as manager of business development for the National Opera of Chile, later becoming head of key accounts at Groupon, Juan had certainly prospered professionally. He had even been offered an attractive promotion, coupled with the opportunity to move to Brazil. However, he was still seeking opportunities for growth and looked to hone his skills and gain international exposure through the MBA program at the Bath School of Management, ranked in the top 100 worldwide MBAs by the Financial Times. 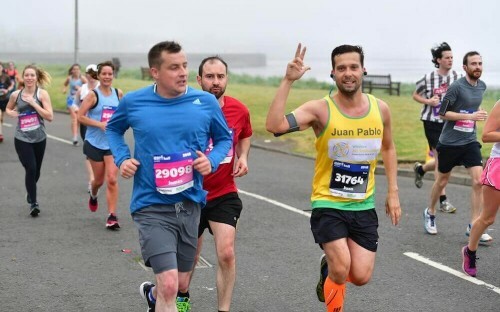 After being awarded the Dean’s MBA Scholarship for Excellence, thriving throughout the duration of the course, Juan is set to graduate in September and has a new role lined up in London with Skimlinks, a leading e-commerce platform. I needed to boost my academic credentials and realized I wanted to improve certain key skills such as leadership, strategy and finance. Even when faced with the offer of a pay rise from my previous employer, I was certain that pursuing an MBA abroad at a top ten UK university like Bath was the right option. Starting an MBA overseas, experiencing new people and cultures, is something really challenging and interesting. I had heard rave reviews from friends regarding the course at Bath and was keen to start. The program is so practical, focusing on applying skills learnt in the classroom to real life scenarios, and there’s so much more to it than reading books and journals. What stands out about the MBA course at the Bath School of Management? For me, the highlight of the MBA program at Bath was the Global Residency international study tour. We travelled to San Francisco to learn how companies such as Google started out and to witness first-hand how they run now. The experience was very hands-on, interacting with and learning from financial and technological experts during company visits. I was able to network with leading figures in their field and also strengthen my personal connections with fellow MBA colleagues. How did the Bath MBA help you land a job in the UK? I think that without studying for the MBA this wouldn’t have been a consideration. The school is really good at coaching and guiding you towards your chosen career. They help you with your CV, LinkedIn, and we had lots of practice interviews. This support was invaluable. I had offers to stay in my home country but I chose to stay overseas and work here in London after experiencing the international environment of the Bath MBA. What advice would you give to applicants considering Bath School of Management? Present yourself authentically. I didn’t hide my failings during the application process; you don’t have to be perfect. Show what you can bring to the MBA and what you have to offer with your experience. Bath really values you as a person and wants to help you grow and progress professionally. I certainly don’t regret my decision and I believe the MBA at Bath has boosted my CV and skillset enormously.